My last post about the garden design of the front walk prompted some very thoughtful comments and questions. There are a couple I’d like to address in a post before we move on. The rest I think will be answered in forthcoming posts. Hm. I don’t understand why you *must* have a straight path out to the street. They’re boring, and as you’ve pointed out, you don’t get any pedestrian traffic where you are. (They’re even bad feng shui they say!) Why not just move the mailbox up next to the driveway where you can either drive or walk to it? This is a very good question, especially since, when I laid out the precise lines of the new walk with a square and mason’s line, I discovered that the mailbox currently sits smack dab in the middle of the proposed front walk. The mailbox is in the middle of the proposed front walk. If the walk is installed, the mailbox will have to be moved. Why not move only the mailbox? In fact, the mailbox at our former home was located at the driveway’s edge. But there are three reasons why I’d still prefer to have a front walk from the porch to the street, and locate the mailbox there. The driveway is much longer than the distance from the porch to the road. Again, this matters more in winter. But most importantly, when I sit and eat breakfast every morning, I sit on a chair that directly faces the kitchen door and has a view all the way to the street. I want to see a garden out there, and the walk provides a design line of sight and the mailbox creates the justification for the walk. I would like to suggest a second driveway, from the road to those double doors, rather than trying to leave a way clear for a truck to drive over the grass every so often. Don’t forget the truck will compact the soil. I’d forget growing anything in its path, including grass. You know, I don’t envision a truck driving through on a regular basis. It would happen if we got a new couch or a family member moved out, something like that. I’m not even talking yearly. At our old house, the septic pumping truck had to drive on our lawn once a year, and I didn’t notice any significant longterm effect. As a matter of fact, I may eventually figure out a way to do what Frances suggests, and design a border that would tolerate the very occasional drive over. We’ll see. In my next post on this topic I will discuss the design of the walk itself. This post is part of a continuing series chronicling how I am designing new gardens at my new (to me) house. 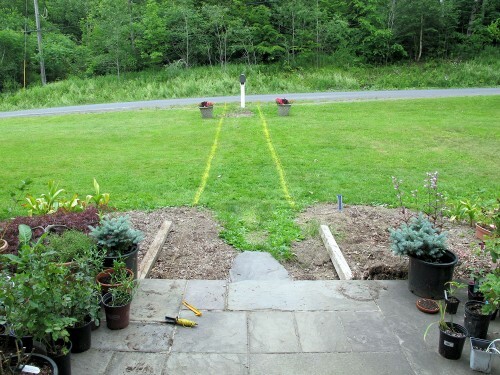 Previous posts include my one year anniversary, an overview and map of the environs, the initial front walk post, and one discussing the front walk garden design. Let your sidewalk have straight lines, but counter it with lush full plantings. Your front walk posts are so intriguing… I keep coming back and rereading them, Kathy. My front walk was here when we moved in so I didn’t have to plan or make it. Like your planned walk, ours also goes straight out to the street from the porch. The mailbox is not centered but a few feet to the right. It’s too narrow and very plain, so I’ve imagined other, different walkways over the years, but this one works for getting mail and it also works for guests who park on the street in front of the house. They pass flowerbeds as they walk from car to door, never setting foot on the driveway. Annie, Decorative brick or stone borders would widen and dress up your narrow cement walk without the need to break it up and start over. I had the same idea as Beth, arc the walkway around each side of the mailbox, leaving space between the mailbox and house for some really nice plantings. Plantings could also extend out from both outer edges of the walkway into a really cool, eye-catching front garden. Then you’d have a beautiful garden to look at each morning. To accomodate snow clearing and mail delivery during winter, I’d have hardscape between the mailbox and road. I love the idea and to each his own…I do not like straight walks but it depends how they are designed and planted…looking forward to your design Kathy. I like the idea of having the walk either split or, curve off to one side or the other – straight most of the way, but with that little quirk at the end. Either way I would have a climber of some kind on the mailbox – something hardy like a “Polish Spirit” clematis. You might want to check your local regs before contemplating moving the mailbox as well – when we went to an enhanced 911 system in our county, addresses were set by the distance between houses, and I’m pretty sure if we wanted to move our mailbox very far, we would have to get permission. The walkway is your connection to the outside world and their connection to you. A curved path and the tretment for the front door gives you so much more to work with from a design perspective. Life isn’t about the shortest distacne between two points, at the end of the day, it is about feeling and emotion. Personally, I live curving walks, but a walk to the front door from the street I think should be a straight line that is the shortest distance between two points. Save the curving walks for where you want to just wander among the flowers, not where you are headed for the front door. If you are going out to get the mail in subzero temperatures, you are going to want the shortest distance between two point, ie. a straight line. The non-gardeners going out to get the mail will want it even more. The walk as you mapped it out on the snow looked really good. It worked with the lines of force and the proportions of the house. 4-5 feet width at least, please. I hate to see skimpy paths. Four is enough if you’re going to keep the borders off the path. Five is better if you want to let them encrouch. P.S. You always want your walk to be *at least* 5 feet wide, so that two people can walk side by side. Kathy, another possibility might be the minor revision of leaving the mailbox where it is and letting the front walk take one or two visual shifts to the left and/or right, without changing the straight line of the physical *walk* until you get to the end. It would give the margins of your walkway staggered edges, which might create interesting planting niches. Let me know if this description is unclear and I’ll try to do better. Just have the walk fork at the mailbox and put a planting bed in the middle. Flare out the sides rather than have them dead straight at the road end. I like the idea of accommodating the mailbox and varying the walkway. Why not an arc around each side of the mailbox. You could even play with the placement of the arc to place a bed behind the mailbox. I can only say let your imagination go. It is only a yard that can be altered to your whim. I’m really interested in seeing what you eventually come up with for this design, and I’m fascinated by the process. It is so important to make sure it looks good from inside the house, especially on those days when you can’t get out there to garden. Just looking at the garden is very therapeutic for me. Having a garden to look at from the office window is the best thing about my new (as of late last summer) front walkway. Also, I have no problem with straight, especially when shoveling snow is a regular issue. Moving a mailbox a few feet is no big deal, especially when compared to the amount of work involved in creating a walkway of that length. It’s going to be fantastic! I know you will get it figured out and done, Kathy, at some point. Thinking about having a garden to look at while sipping coffee or doing any number of indoor things will greatly enhance the quality of life there for all. But you already knew that.